PLUS: Sculptor Jean St. Jean takes you behind the scenes! Welcome back, citizens! 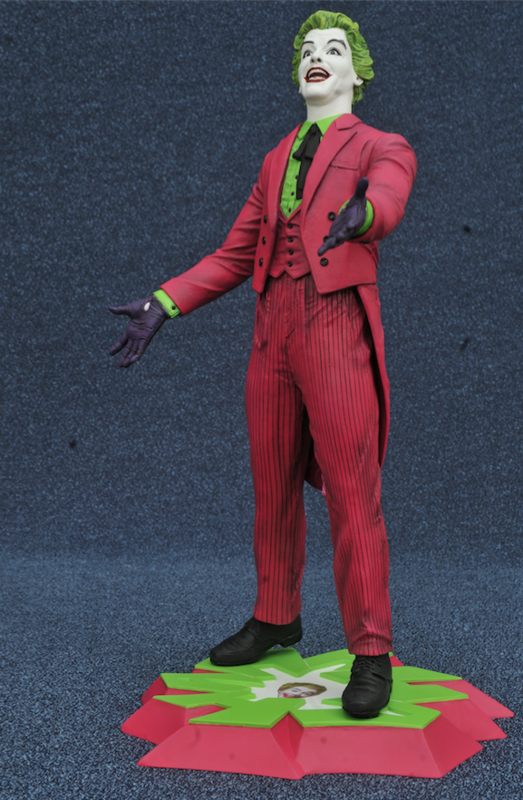 It’s our latest look at Diamond Select’s BATMAN ’66 statues and busts (click here for the full INDEX of Bat-tastic features) — and this time we’ve got your first, up-close look at the Cesar Romero Joker statue, due this winter. 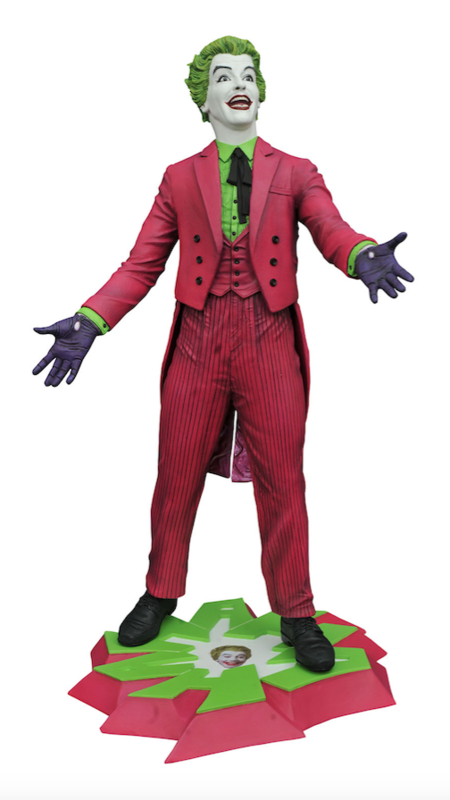 Like the other statues in the line — such as the forthcoming Adam West Batman statue (click here) and the already-released Julie Newmar Catwoman (click here) and Yvonne Craig Batgirl (click here) statues — it’ll be in the $150 range. It’s expected to be solicited in the next Previews catalogue due at the end of August. 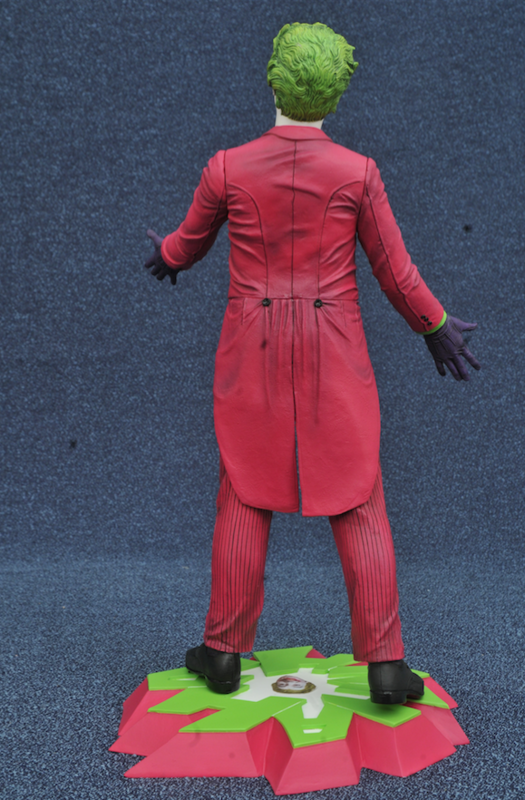 This statue was first shown at San Diego Comic-Con, but this is the first time you’ll be able to check it out in full detail, in these prototype pix provided by Diamond itself. Dan Greenfield: Up to now, you’ve been doing the busts. 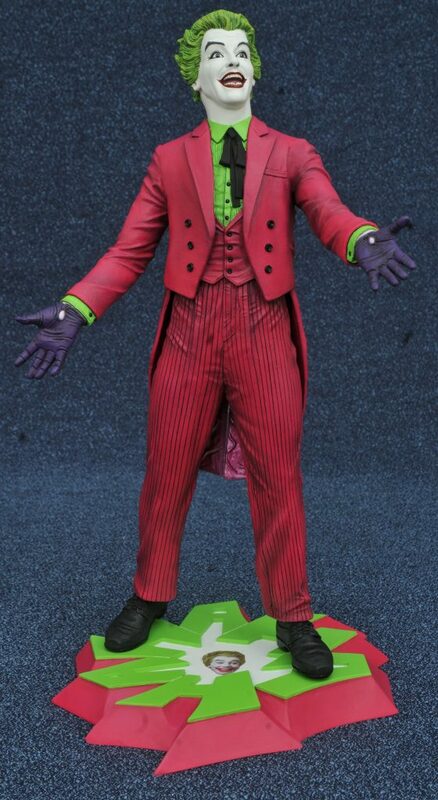 Now you’re getting to do a full statue of Cesar Romero’s Joker. Which do you prefer? Jean St. Jean: I like the continuity of doing the busts and gradually working my way through the heroes and the rogue’s gallery in that format. I’ve done that in the banks as well to a lesser extent. I do also enjoy getting a chance at the full-figure statues, though, to show the full expression of the gesture. Basically I’m happy with any format DST wants me to work in on this license. I love this show! 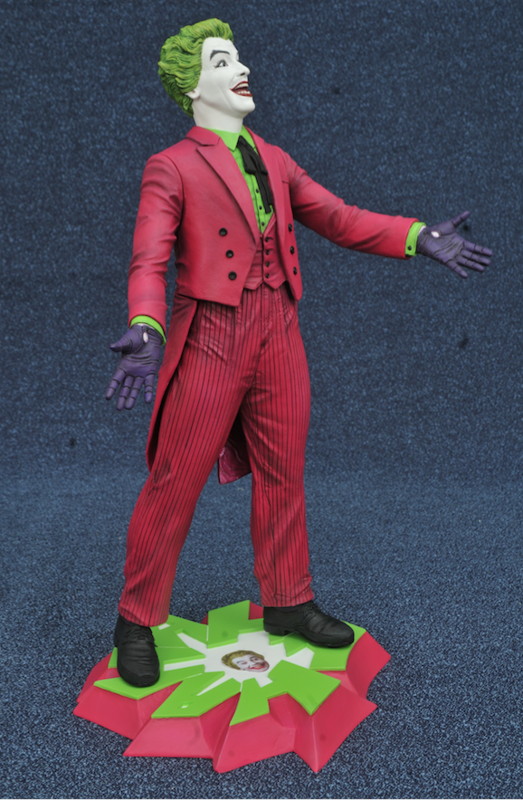 Dan: Did you change anything with Cesar Romero’s likeness between the bust and the statue? Jean: Likeness-wise it’s been a study for me from the mini-bust, to the bank to this statue. At each stage the licensor has provided notes as to the direction of the likeness, which I carefully follow and take into consideration each time I return to the character. This time the sculpture was approved with no changes, so I guess I’m hitting a groove with these guys! He’s had a pretty broad grin each time, so I try to vary the opening of the mouth, the expression in the eyes and match that to the body language of his pose. Dan: I know this is old hat for you, but for fans who may not know how it all works, take us through the process. For example, I noticed that the prototype shown at San Diego Comic-Con was larger than the statue will actually be. Jean: Generally, I start roughing out the basic pose on a common base I sculpted according to Barry Bradfield’s concept art. I make sure what I’m doing makes sense in context with all the other busts I’ve done so far. When that’s gelling I start creating the basic drapery of the costume so it conveys the gesture of the body beneath. Then I move on to detail, the portrait and any weapons or accessories. Through all this I’m scouring the net and watching the appropriate episodes to make sure I have all the details correct. We typically work slightly larger than production to compensate for material shrinkage in the factory process. Dan: Given the choice, what character would you want to tackle next? Jean: I think False Face would make a great bust and Alfred would be fun, but I would love to see if we could do the Green Hornet and Kato since they appeared on the show in the series crossover!